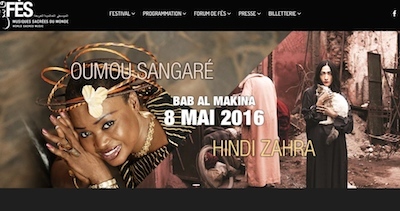 The Fes Festival of World Sacred Music will take place from May 6th - 14th this year in in the imperial city of Fes. The festival was founded in 1994 by the Moroccan scholar and philanthropist Faouzi Skali and was created to showcase major musical traditions of sacred, spiritual music and world music. The current Artistic Director is Alain Webber. Each year the Fes festival celebrates artists from Muslim, Jewish, Christian, Hindu and other faiths to perform together in a spirit of mutual respect and collaboration. The Fes Festival is comprised of: A four-day Forum called Rencontres de Fes under the rubric "Giving Soul to Globalisation" where politicians, social activists, academics and religious leaders come together in dialogue to discuss the urgent issues of our times. These include conflict resolution, climate change, urban renewal, social justice and much more. Intimate afternoon concerts at the Dar Batha Museum and its surrounding Andalusian gardens. Art and film exhibitions, poetry readings at the Dar Bartha Museum and other locations within Fes. Sufi nights: Sufi Music rituals concerts that begin at midnight performed by Moroccan Sufi brotherhoods in the Dar Tazi gardens, in the heart of the Fes medina. In the morning, visitors can take part in seminars or round table discussions covering topics related to the theme of the festival. By attending the discussion, you can gain extra insight into the meaning of the festival. In the afternoon, evening, and late at night, there are concerts given by performers arriving from every angle of the globe. These musicians help celebrate all the cultures and religions of the world through a multiplicity of their songs and rituals. The musical spectrum heard includes early European classical, Sufi ritual songs and trance music, Arab-Andalusian rhythms, a Bulgarian orthodox choir, Hindustani chants, Celtic sacred music, Christian Gospel, Swedish chamber choir, Pakistani Qawwali incantations, Egyptian madhi odes, flamenco-style Christian saeta, ancient Indian gwalior chants and Turkish whirling dervishes. Traditionally, the festival’s most impressive afternoon concerts take place by the Dar Batha Museum, which is set amidst a beautiful Andalusian garden and has a backdrop of the Atlas Mountains. During the evening concerts are held at the Bab Makina and Palace Boujeloud. After the last concert of the night is over, the medina is the place to head for a continuation of a once in a life time experience. Every evening at midnight, there are free "Sufi Nights". These highly popular Sufi ritual trance performances are held at the Dar Tazi Palace gardens where Sufi brotherhoods like the Hamadcha, the Aissaoua and The Master Musicians of Jajouka perform while you relax on Berber rugs and sip mint tea. Friday, May 6th: Bab Al Makina - Opening Night Premier 21h00 A Sky full of Stars: International Premiere Women of myth and poetry from Sheherazade to the Queen of Sheba With women artists from Morocco, Mongolia, Azerbaijan, Iran, Ethiopia, India, Lebanon, Italy and Africa, with an oriental orchestra.